I go to church all the time. Sometimes I'm excited to be there. But most of the time, I have to gear myself up to go and sometimes it's really hard to sit through it all. But almost every time I leave, I'm glad that I went. And when I don't go at all for various reasons, I truly do feel a void. Who knows if that's just because it's a habit or what, but I think there is more at work when I go to church and make it a priority. Last year, I moved into my new singles ward. I was really nervous about it. I had just left my ward in Dallas that was very tight knit. I always lived with people in the ward and most all of my social activities involved someone in the congregation. Going to church was expected but enjoyed, not just for worship but also as a main pinnacle of my social life. So moving to Salt Lake on my own and having to go to church by myself frightened me a wee bit. I've had to do this plenty of times before, I can't count how many different singles wards I have been in but the number has got to be somewhere near 20. The whole introducing-myself-to-strangers thing has become second nature, and of course I'm grateful for that opportunity to feel comfortable even in new situations. So I went to my new ward. And it was hard. There were a lot of people. We had sacrament meeting last in the 3 hour block, and by the time it started, I was already ready to go. I sat alone near the front on the right side of the chapel. I was tired of trying to talk to people so I just got out my sketch book until the program began. Once it did, I was shocked to learn they were changing the bishopric that day. 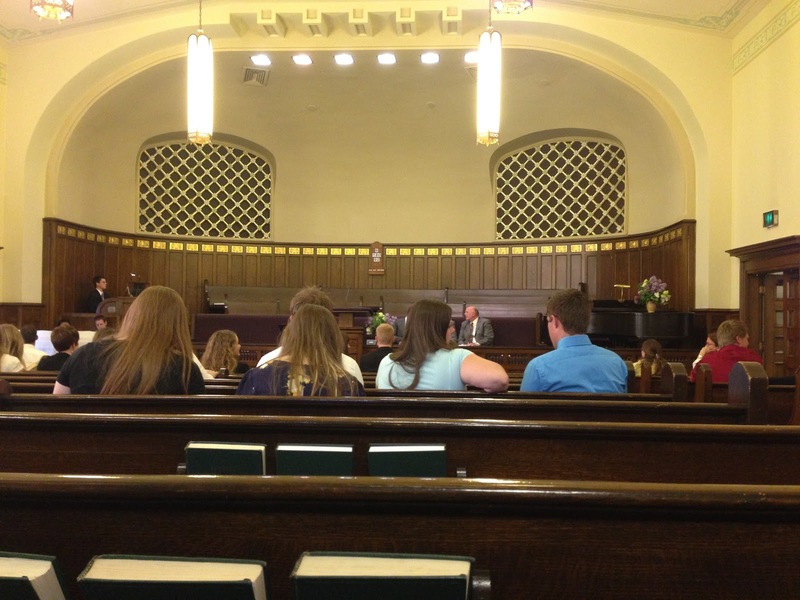 All of the 3 new men who were called to the bishopric had never been in a singles ward bishopric. They were bright-eyed and excited to get to know the young single adults of our area. They were excited and so it made me excited. They were new, so we could all be new together! "Well let me know when you figure out a calling for me because I'm anxious to get involved where I can." Brother Taylor replied jokingly, "Well you don't play the organ do you?" "Well I do play the piano and I've always wanted to learn..."
"Really?! That would be awesome. We've been praying and praying to find someone who can play the organ for us. In fact, just this morning we fasted as a bishopric to find someone willing to play." I panicked. "Oh cool, well yeah I mean maybe I could try, I don't know, I'm not very good." I left the interview, went back home and had one of those what-do-I just-do moments. In fact, I have a post-it note set at my office that has a woman smiling on it and it says, "Stop me before I volunteer again." I'd been working on not over-committing myself to too many things and here I had just done precisely that. But there was nothing I could do, it was out of my hands. I went back to the church, this time for our regular meetings. I went to Relief Society and as I was heading to Sunday School, I got a text message asking if I could come meet up with another member of the bishopric. "Here it comes," I thought to myself. I walked to the office and met Brother Ward. He welcomed me in and asked lots of questions about myself. He was very intrigued by my career choice. He was fascinated about graphic design and felt strongly that we need visual language to make sense of things, and how he feels it's just as important as other languages of learning. Validation? Check. He told me that he had heard I play the piano and wondered how I would feel about learning the organ. I was totally honest with him. I told him that I'm new in the ward and I'm a bit scared. I can only play about half of the songs in the hymn book and I don't know if I'll be able to confidently play, especially while people are singing. He calmed my fears and told me that it would be ok. He said that I could pick all of the songs we sing. And that even if I only learn 6, we can rotate the 6 songs every week. He said I could play the piano if I prefer and they could put a microphone up to it so it would be loud enough for the congregation. He said he would give me a key and security fab to the building so that I could come in and practice whenever I want. Suddenly it didn't seem so impossible. I accepted the challenge and told him I would be our organist. The next week I practiced for hours. I chose all the easiest songs in the hymn book. I practiced them at the piano, and then I took them to the organ and experimented with the controls. I invested in a stack of post-it notes so that every week I would choose my pedal settings for the song and then write a post-it note above the setting, so I knew which song had which pedal. It was so confusing. But when I finally played in church, all of my hard work paid off. People sang! They followed along! They didn't look up at me when I made a mistake! The settings on the organ worked! This went on for several months as I lived in the ward. 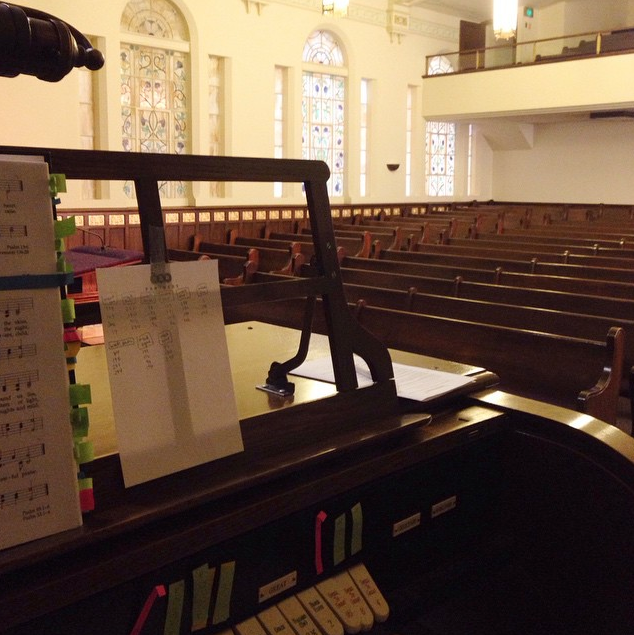 Each week I would spend a couple hours practicing alone in the chapel and each week I would play prelude music, opening hymn, sacrament hymn, congregational hymn, closing hymn, and postlude. I sweat more than I ever have before on a Sunday, but I played the very best I've ever played. When I practiced, it truly felt like someone was helping me. And that my fingers couldn't have played all of those complicated notes on their own. But here's the kicker (and the point of my post). Every single week, without fail, Brother Ward would come up to the organ after sacrament meeting while I was playing postlude and put his head down near the hymn book so I could see his face, and he would smile really big and give me two thumbs up. Then he would whisper, "Great job!" "Thanks!" I would whisper back. It made me feel like a million bucks! After all of that effort every week, and all of those post-it notes, I felt so appreciated. He knew it was going to be hard for me. He knew I was so scared of playing in front of all of those people. And he made a special effort every week to come tell me that I did a great job. And if he wasn't there, then the bishop or Brother Taylor would come over. Some weeks, all 3 of them thanked me separately! And on my last Sunday in the ward, the week before Greg and I were to be married, they all thanked me for my service and said how grateful they were that I had volunteered and then stuck with it. Now I've had a lot of callings. I've had a lot of opportunities to give service in the church. Sometimes it's not very glamorous. Sometimes it feels like we do a lot of work and we're not efficient and we don't do much good. But the thing I learned from playing the organ was the power of feeling appreciated. I knew that the bishopric was counting on me. I knew that they needed my talents to help bring the Spirit into our chapel. And because they appreciated me, I wanted to try harder and be more committed. Their gratitude made me feel confident. I was more excited to go to church. I was more willing to stay for the full block and get to Relief Society on time. They made me feel like it was important for me to be there and that there was a spot for me in the ward. Fast forward to this year. Greg and I are in our first ward as a married couple. We've been primary teachers and it's been just grand. We love love our kids, we love singing time, and it's been really nice to just focus on the basics of the gospel. The relief society president found out that I'm a graphic designer. So at an activity one night, she pulled me aside and asked if I could make her a map. She said that they didn't really have a good map of our ward boundaries. It's in a complicated area because there are a ton of apartment complexes in our ward and it's hard to know which is in our ward and what is in the other wards. I agreed and said I would send her something the next week. When I got home, I had my same panic. Why am I over-scheduling myself? I have family in town for the month of July, we have a super busy project at work right now, Greg and I are moving at the end of the month, we're frantically trying to plan all the logistics for our trip to Europe, I'm designing wedding invitations for so many people, and I just can't take this on right now. So I took a screen shot of a google map, cut off the boundaries that aren't in our ward, and sent it over. It only took about 20 minutes and I thought, "Hey, it's better than whatever she currently has." But when I saw her again, she explained some more things she was hoping for in the map. I was listening to what she was saying, but in my head I was just thinking of how much time it was going to take. We ended up looking up the exact location on the block of every apartment in our ward, and then I created a shape for it on the map, numbered them, added notes for parking in some situations, made a key with the names and addresses of each complex, etc. It became fairly involved and required a couple meetings and emails. Greg and I are moving this week so I wanted to make sure I could finish it before we left the ward, as I knew communication would be more difficult when we lived further apart. Let no man count them as small things; for there is much which lieth in futurity, pertaining to the saints, which depends upon these things. She said, "I know that this may just be a small thing to you, but it means so much to me." In her scriptures she wrote "ward map" next to this scripture. As I listened to the message, I immediately remembered how Brother Ward had made me feel when I played the organ. And now hearing her muffled voice over the phone reminded me that none of these efforts go unnoticed. Maybe my blog isn't the right forum for something like this, but I just want to document how good it feels to use the skills I have for the building up of the kingdom of God. And more importantly, how good it feels when it's acknowledged by the people who asked you to do it. I want this to be a reminder to me about thanking the people in my life who do the small things and the big things. And how we all depend on the small things for our future. We literally depend on them to keep the work moving forward. It's good people like Brother Taylor and Sister Van Orden that help me realize no good deed goes unnoticed. As some of you may recall, I left my job in Dallas to move to Salt Lake City. I loved my job and I loved a lot of the people I worked with. But there were so many! In a company of 700, it felt like you only got to know someone for a little snippet of time when you worked on a project together. But then once it was over, it seemed like I would never see them again. We were spread out through several floors of a skyscraper and so you really had to be intentional about who you ran into during the day. One thing that I hoped for with my job change was more of an environment that cared about who you were outside of work. To me, things like holiday parties, staff meetings, random team building activities, and impromptu barbecues are very important. It's the opportunity to get to know my team away from the office. At my new job in Salt Lake, there are only 24 of us squished into a little house. You literally "run into people" all the time. And it's great! One thing I love about my co-workers is that so many of them share my love for food. A few months back, we started a food club. We bring in recipes, post them on a blog, and go to new restaurants. It's really fun! Delicious! We only had a few sprinkles of rain before it cleared up for the night. When it got dark, the candles were lit, and the torches were fired up. The ambiance was beautiful, the conversation was great, and the stars were shining brighter up there. We left stuffed and filled with joy for this phase of our life. We're so grateful to meet new people and enjoy getting to know them in such beautiful settings that we have in Utah. This past week, Greg and I travelled down south for a Snyder family vacation. We did a combo of Lake Powell part of the week and then stayed at my parents home in St. George the rest of the time. We didn’t take too many pictures at Powell, but it was a great time. The water is so warm and the scenery is beautiful. I think I’ve gone every summer for the past 15-ish years, one of our favorite family traditions for sure. Although the temperature was sky high, it’s nice to have some downtime at a house where you feel comfortable, but you don’t have the luxuries of home to distract you. I always forget my to-do lists in St. George and just relax. Which is exactly what we did for a couple days. There were rides in the RZR, singing and playing piano, experimenting with electronic helicopters, cooking, swimming, chatting, lego building (lots and lots of lego building), roasting marshmallows, eating, and of course driving. America is the best. Happy birthday USA!